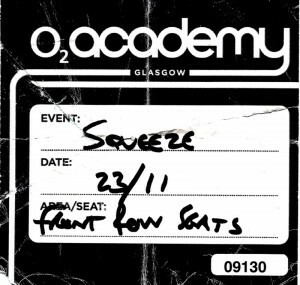 4 Responses to "Squeeze – 23 Nov 2010 – live at Glasgow Academy"
I think you mean “The Academy, Glasgow” which is quite a different place to Glasgow Academy, just in case there are several hundred school children getting overly excited! Firstly what a great support in the Lightening Seeds, excellent warm up making it two shows for the price of one. Now to Squeeze. A brilliant boxing match style announcement led each member of the band on stage with the show kicking off unusually with Black Coffee In Bed that in a brave move led the audience through an early singalong. The show seemed to start slow somehow and the gel between the band did not seem to be as it was with Stephen Large on keys and in particular a low point early on was When The Hangover Strikes which was played well, sung well but failed to grip the audience who decided this was a great time to hold a conversation throughout a song, something I have not heard before at a Squeeze gig especially from a Glasgow audience. Something seemed missing. The show really sprung into life with a stunning version of The Knack. Highlights were some of the early songs like The Knack, Its So Dirty and a brilliant version of Model. These songs were played with the energy and enthusiasm of a band thirty years their younger. The hits were delivered note perfect and with the extra pieces of music thrown in before and after some of the hits the band have really enhanced them, the hits sound better now than ever. The introductions from Glen during Tempted and each members solo when introduced was well rehersed and really entertaining as was the new dance routine. The backdrop films and animation were excellent especially the animation throughout Up The Junction and the old cuttings and memorabilia on show brought back so many memories while listening to the songs. No doubt the best thing that has happened to Squeeze for a long time is finding Simon Hansen, the guy is a stunning drummer and a first class entertainer that really holds the band together. Keyboards were far too loud with the levels just not set right at all. The tour programme says that the current Squeeze line up is the best yet. That was with Lord Large on keys and I would have to agree that that was the best, tightest, entertaining and musical Squeeze line up ever in the Thirty years I had seen them live. Steve Nieve is a class act and has been for a long time and you can clearly see the friendship between him and the band members but it seemed too early for him and it will take time to gel. After around seven or eight songs things seemed to start to gel and the show went from good to excellent. As usual the band left the audience wanting more. The programme and the merchandise were also excellent and well priced. I know some of this may seem negative but overall the show was stunning, the band are playing better now than ever and Glenns vocals, well can they get any better, yet again they left me wanting more. Exciting year ahead for Squeeze and their solo projects, cant wait. Come back soon Cheers Billy.